Finance Minister launches Kulanu's campaign in Ashkelon, in the presence of ministers, Knesset members and hundreds of activists. 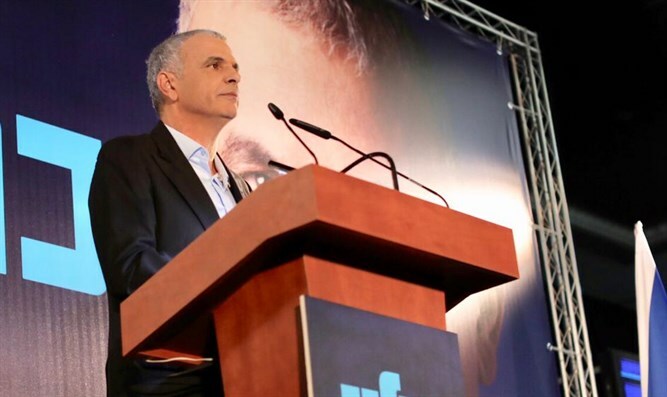 The Kulanu party, headed by Finance Minister Moshe Kahlon, on Wednesday launched its election campaign, in the presence of ministers, Knesset members and hundreds of activists. During the event, which was held in Ashkelon, Kahlon referred to the unflattering polls, which are predicting that Kulanu will not reach double digits in Knesset seats in the April election. "The same pollsters who predict five seats for us, told me a week before the local elections in Ashkelon that Mayor Tomer Glam would lose, and look at this, he is here with us, the mayor of Ashkelon. With great responsibility, I tell you that what they did to us four years ago they are doing to us again today,” said Kahlon. "They want me to join one bloc or another, I would join - but bring me a bloc that cares about the people, a social bloc that knows how hard it is, which makes minimum wage, who knows what it is to like to be unemployed. That's what I'm looking for," he continued. "You know what it means to get one child out of the cycle of poverty? Now multiply it by 24,000, and the whole journey was worth it. Everyone attacked us and it was worth it because we saved the children,” said Kahlon. "Everyone asked me what ‘superstars’ am I planning to bring in, I told them that every superstar will not succeed in the end. I have to look for a superstar? Explain to him what the Knesset is, what a committee is and what a law is? It would take him a year and a half to learn the job. Look at the Knesset members of Kulanu. Why do I need to look for someone who was on television?" "If I stand here and prove to you that things were accomplished that have not been done for 30 years and that the Kulanu team is a winning team, a team that has done and acted and moved mountains. You do not replace them. You continue with them to tackle the next challenges,” stressed Kahlon. “Anyone who wants to be a social leader must care, not because you were told as a child that you’d be prime minister. There are no shortcuts, certainly not in politics. We have a role to play, to prove to the polls that they were wrong this time too," said the finance minister.